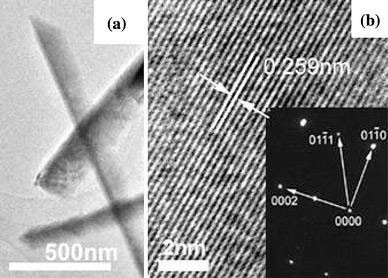 Glomerate GaN nanowires were synthesized on Si(111) substrates by annealing sputtered Ga2O3/Co films under flowing ammonia at temperature of 950 °C. X-ray diffraction, scanning electron microscopy, high resolution transmission electron microscopy and Fourier transformed infrared spectra were used to characterize the morphology, crystallinity and microstructure of the as-synthesized samples. Our results show that the samples are of hexagonal wurtzite structure. For the majority of GaN nanowires, the length is up to tens of microns and the diameter is in the range of 50–200 nm. 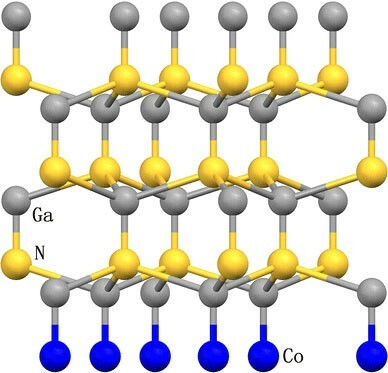 The growth process of the GaN nanowires is dominated by Co–Ga–N alloy mechanism. Gallium nitride (GaN) has gained considerable attentions due to its wide and direct band gap (3.39 eV at room temperature), high thermal stability and strong resistance to radiation [1–5]. GaN-based materials are expected to be a good candidate for high-power electronic devices, light-emitting diodes, and laser diodes in the blue and UV wavelength regions [6–8]. In recent years, more and more research efforts have been devoted to the one-dimensional nanoscale materials because of their fascinating electronic, optical and mechanical properties in fabrication of novel nanodevices [9–12]. The GaN nanowires are of interest due to the giant electrogyration effects . Many attempts have been made to synthesize GaN nanowires using various techniques such as the carbon-nanotube-confined reaction, the anodic alumina template method, arc discharge, laser ablation, catalytic chemical vapour deposition, and the oxide-assisted growth route [14–26]. Compared to these techniques, the radio frequency (RF) magnetron sputtering is one of newly developed methods, which has many advantages on synthesis of GaN nanowires such as simplicity for deposition of multicomponent, effective charge of sputter-time, no corrosive gas and low processing temperatures . In this work, GaN nanowires were synthesized by ammoniating Ga2O3/Co thin films deposited on Si(111) substrates with RF magnetron sputtering method. The metal Cobalt was used as the buffer layer, which was expected to change the surface energy distribution and to enhance the formation of GaN nanowires. To our knowledge, so far no experimental study has been done on GaN nanowires in this method. Gallium nitride nanowires were synthesized by the following steps. First, the silicon substrate was ultrasonic cleaned in absolute ethyl alcohol and de-ionized water for 30 min in sequence. Second, the Co films were deposited on Si substrates by sputtering a Co target (99.99%) for 10 s with a JCK-500A RFMS. The thickness of Co layer was about 10 nm. The background pressure of the sputtering chamber was about 5.5 × 10−4 Pa, and Ar (purity: 99.999%) under 2 Pa pressure was introduced into the chamber as the sputtering gas. The distance between the target and the substrate was 8 cm. Under these conditions, the Ga2O3(purity: 99.999%) thin films were grown on Co-coated Si(111) substrates by sputtering a sinter Ga2O3target for 90 min. The thickness of Ga2O3layer was about 500 nm. Finally, the Ga2O3/Co films were ammoniated in an ammonia atmosphere with a flow rate of 500 ml/min in a horizontal tube furnace. The ammoniating temperatures was 950 °C, and the duration of ammoniating is 10 min. After reaction, a deposit of light-yellow layer was found on the substrate surface. We studied the structure, morphology, composition and crystallinity of the as-synthesized samples using X-ray diffraction (XRD, RigaKu D/max-rB Cu Kα), scanning electron microscope (SEM, Hitachi S-570), high resolution transmission electron microscope (HRTEM, Tecnai F30) and Fourier transform infrared spectroscopy (FTIR, TENSOR27). 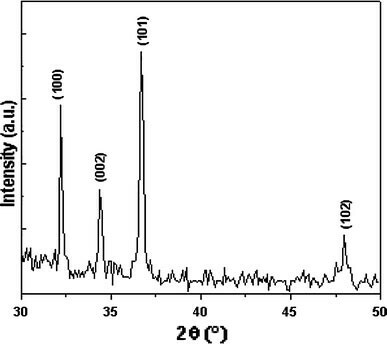 The overall crystal structure and phase purity of the as-synthesized sample are assessed by XRD. Figure 1shows the XRD pattern of the sample grown on the Si(111) substrate at the ammoniating temperature of 950 °C. The peaks positioned at 2θ = 32.19°, 34.41°, 36.68° and 48.01° correspond to the reflections of GaN(100), (002), (101) and (102) planes, respectively. The strong diffraction peaks can be indexed according to the hexagonal wurtzite GaN with lattice constants ofa = 0.318 nm andc= 0.518 nm, which agree well with those of bulk GaN crystal. No peaks of impurities, appearing other crystalline phases associated with gallium oxide were detected in the spectrum, suggesting that the as-synthesized product is pure wurtzite GaN. The morphology of the product is characterized by SEM. The substrate is covered by the glomerate GaN nanowires randomly. Figure 2a shows the SEM images of the glomerate GaN nanowires, indicating that the majority of the nanowires with a radial distribution are straight, and are grown with diameters of 50–200 nm and lengths of tens of micrometer. Figure 2b exhibits a partly magnified image, showing that most of the nanowires have a smooth surface. Besides, no particles impurities or other nanostructures are found in the SEM observation, indicating that the product consists of pure GaN nanowires. Figure 3a shows the HRTEM image of the GaN nanowires, with the smooth surface. Atomic-resolved view reveals negligible defects in the lattice planes (see Fig. 3b). The interval of closest interplanar distance is measured to be 0.259 nm, which corresponds to that of the crystal planes (002) of GaN. The inset is its corresponding selected-area electron diffraction (SAED) pattern, showing the single-crystalline wurtzite GaN crystal and the growth direction parallel to the  direction. The nanowires are all grown with the same direction. 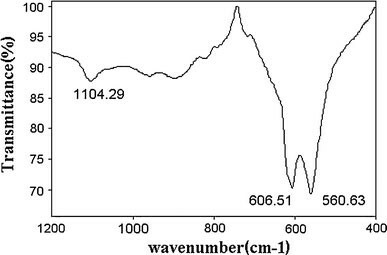 Figure 4 shows the FTIR transmission spectrum of the GaN nanowires synthesized at 950 °C. The absorption of infrared radiation causes the various bands in a molecule to stretch and bend with respect to one another . In the infrared spectrum, the transverse optical phonon mode appears in the form of an absorption band. Our infrared spectrum for GaN nanowires ammoniated at 950 °C shows an absorption band at 560.63 cm−1, corresponding to the E2 high phonon mode of GaN, which is consistent with the previous experimental results . Another sharp absorption band at 606.51 cm−1 is due to the local vibration of the substitutional carbon in the Si substrate crystal lattice. The absorption band located at 1104.29 cm−1 should be attributed to the Si–O–Si asymmetric stretching vibration in the SiO2 resulting from oxygenation of Si substrate. Based on the above analysis, the growth process can be described as follows. As we known, the fluidization temperature of nanosized catalytic metal particles is lower than the melting point of bulk metal. Thus, liquid Co droplets are formed at reaction temperature on the Si surface. At the same time, atomic nitrogen and hydrogen are produced at the same temperature by the decomposition of NH3 introduced into the quartz tube and Ga2O3 is deoxidized into Gallium vapour. The surface energy distribution will change greatly when solid state Co translate into liquid state Co, which may produce some energetic favored sites for the absorption of gas-phase reactants . Subsequently, the supplied gaseous Ga and N were absorbed by Co droplet to form a kind of Co–Ga–N transition alloy droplet. When the concentration of GaN exceeds a saturation point of the Co–Ga–N alloy, GaN begins to grow from the alloy droplet to form nanowires, as observed in the model of Fig. 5. Therefore, we describe the growth mechanism as one assisted by the Co–Ga–N alloy. In summary, the glomerate GaN nanowires were synthesized on the Si(111) substrate using Co as the catalyst. The diameters are in the range of 50–200 nm and the lengths are up to several tens of microns. Most of the nanowires are single-crystalline wurtzite structured GaN crystals grown with the  direction. The catalytic growth mechanism of GaN nanowires is described as the alloy mechanism.